A six-storey building with basement and attic-storey, designed by Young & Mackenzie Architects for The Scottish Provident Institution and built primarily in sandstone by Robert Corry in two phases between 1897 and 1902. 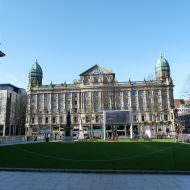 The first phase, at the corner of Donegall Square West and Wellington Place commenced construction in 1897 and was completed by 1900. 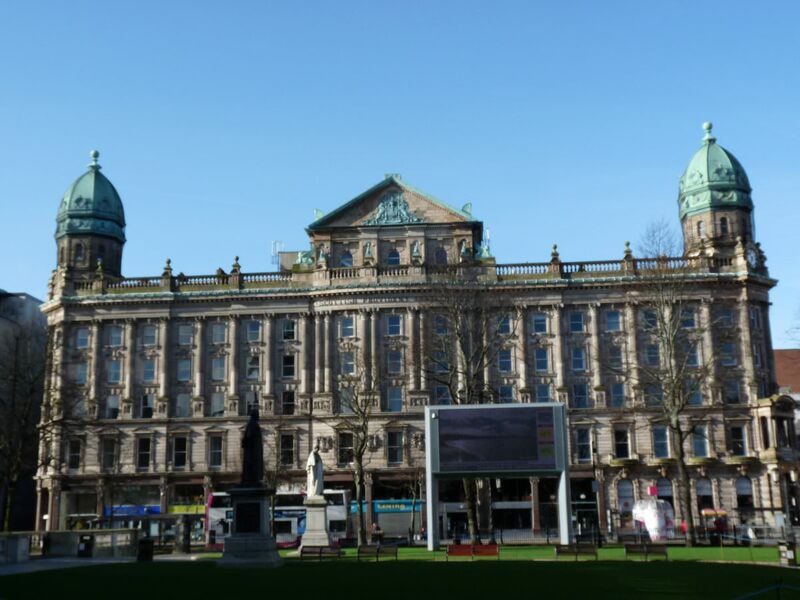 Construction of the second phase, fronting onto Donegall Square West, commenced 1900 and was completed by 1902. The building’s ornamental carvings, including female heads, representing Scotland, Ireland, England, India, Sudan and Canada were carried out by Purdy & Millard. Sculptures also depict the prevalent industries at the time of construction, including shipbuilding, rope making and weaving. Ward & Partners installed the stained glass within the first floor lobby area depicting the arms of Scotland. 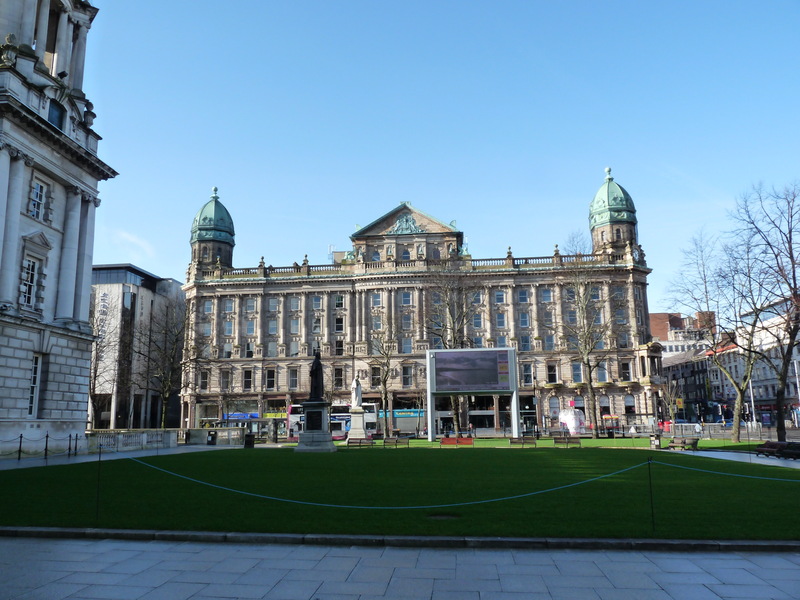 The building was grade A listed (HB26/50/012) in June 1979 and during 1982 – 1983 the external stonework was restored, a projecting canopy installed over the Donegall Square West entrance, and some of the building’s statues were removed. 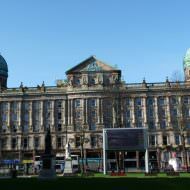 The building was acquired from Abbey (Abbey controlled the Scottish Mutual and Scottish Provident closed with-profits subsidiaries) by ING UK Real Estate Income Trust Ltd in July 2005. ING later sold the building in December 2007 for £20.975m to SP Properties Ltd. Your Space PLC (serviced office provider) acquired 25,600 ft2, with an option for a further 7,700 ft2, at a rental rate of £15.75 per ft2 in November 2008. Extensive refurbishment of the building, including the interior, exterior and roof, was undertaken during 2009. 8-10 Wellington Place: Black & Lizars. 6 Wellington Place: Matchetts Music. 4 Wellington Place: Mortgage Shop. 1 Donegall Square West: Freshii (opened March 2017). Previously Sony Centre. 2-3 Donegall Square West: Apartment Bar & Restaurant (opened 2000). 4 Donegall Square West: Clements. 5-6 Donegall Square West: Centra. 8-9 Donegall Square West: Greggs (opened September 2016). Previously The Spinning Wheel since c1980. 10 Donegall Square West: Caffe Nero (opened late 2012). Previously Thomas Cook. 11 Donegall Square West: Patisserie Valerie (opened May 2016). Previously Jaeger until Nov 2014.